When I entertain I like to make sure my table looks beautiful for my guests. I choose the china to match the occasion and I like to use crystal wine flutes. I also love to use chafing dishes. They are especially handy when I have lots of guests. Keeping the food warm is always my main concern but I’m also thinking about my decor and the presentation of the table. I love using a round chafing dish for this reason. Have you seen how good they look? Don’t miss out on an item that can really add that “something extra” to your home. ⇒ See the Top-Rated Round Chafers, Click Here. Sure, there are lots of ordinary chafing dishes available but I like to make my chafing dishes a feature when I entertain. And why not? After all, they do hold the entree which is the star of the show when everyone sits down for dinner. Here are the best round chafing dishes to add to your home. This Winware round chafing dish has a stunning stainless steel mirror finished cover. It holds 6 quarts and the cover can roll over to 90 degrees or 180 degrees. This chafer includes one round food pan, the water pan, a dome cover and the fuel holder. The dome cover is a roll top so there’s no need for a lid holder. The stainless steel is heavy commercial grade, yet it is still light weight to lift. It looks stylish and modern. This is a high-quality chafer. This round chafing dish has a double bowl set-up. There’s the bottom water pan for steaming water and the serving pan above it. This chafer looks stunning on your table for formal occasions or casual dining. Your guests will definitely notice this addition to your home. It keeps the food warm and you can be happy with it’s stunning appearance. 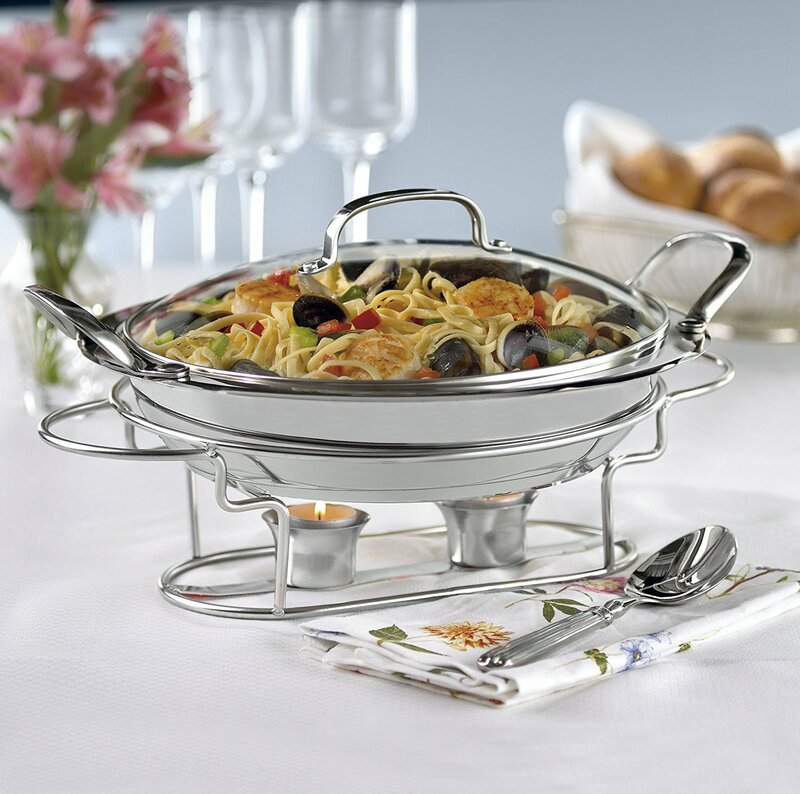 This Winware chafing dish makes any occasion special. You’ll find it attracts a lot of comments from guests and it looks so good you’ll want to use it every time you have guests over. It’s an impressive chafing dish you’ll want to own. The Winco Round Crown Chafer is a more traditional dish. If you have antique furniture or a traditional style of décor, this Winco round chafing dish will be perfect. With more detail than other chafers, it stands out as a beautiful addition to your table. As well as its round shape and detail, it also boasts wooden detailing on the handles. This traditional chafer has a 6 quart capacity. It’s 18/8 stainless steel construction with a mirror finish. The dimensions are 17.13″ x 13.25″ x 16.5″ (LxWxH). This round chafer is a double pan set up. The water pan is underneath for warming with the food pan above it. The dome cover lifts off, it is not hinged. It includes the fuel holder underneath. If you have beautiful decor you want your chafing dish to match. The Winco Round Crown Chafer is a delight to own and use. This Cuisinart round chafing dish is available in three different sizes, 11-inch, 12-inch or 13.5-inch. But the 11-inch is the only round chafer. The 12-inch is rectangular and the 13.5-inch is an oval shape. These chafers still complement each other despite being in different shapes. You can choose the size you need or buy multiple sizes to serve a buffet. The dimensions when the pan is sitting in the rack is 17-inch x 11-inch x 8-inch (LxWxH). It has a 2.6 quart capacity. Constructed from 18/10 Stainless Steel, this Cuisinart chafer has an aluminum encased base for even heat distribution. It includes a glass lid. The lid lifts off, it is not hinged. Both the stainless steel pan and the glass lid are dishwasher safe. One of the biggest advantages of this chafer is that you can serve directly from the oven or stovetop using the wide stainless steel handles for easily transporting the dish. This chafer doesn’t use chafing fuel. It keeps the food warm using two tealight candles. At first you may not think the candles will be enough, but they really do keep the food warm. 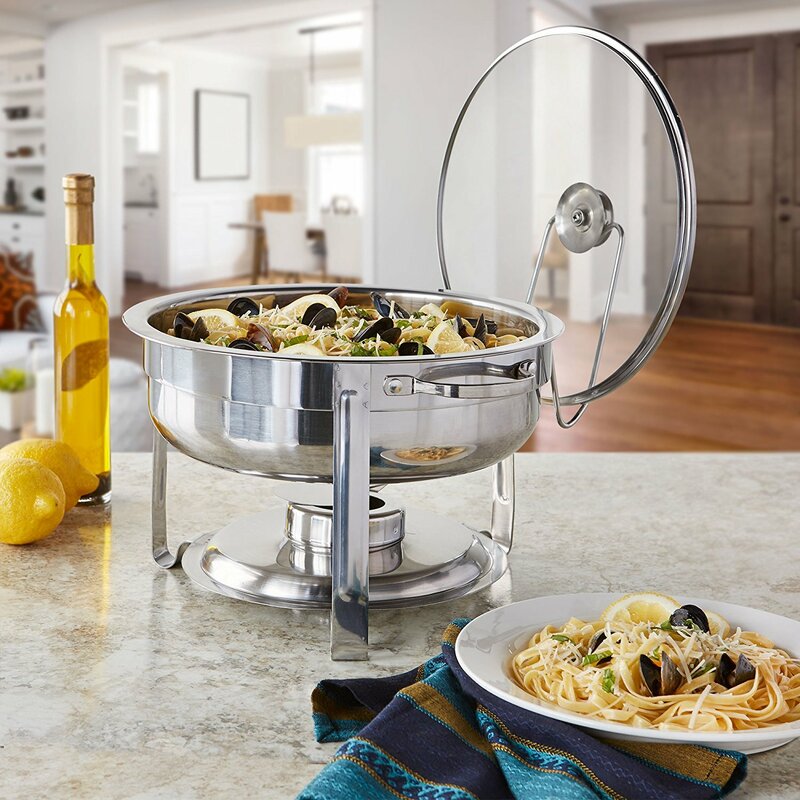 If you’re looking for a high-quality elegant round chafing dish for your home, you’ll absolutely love this Cuisinart chafer. 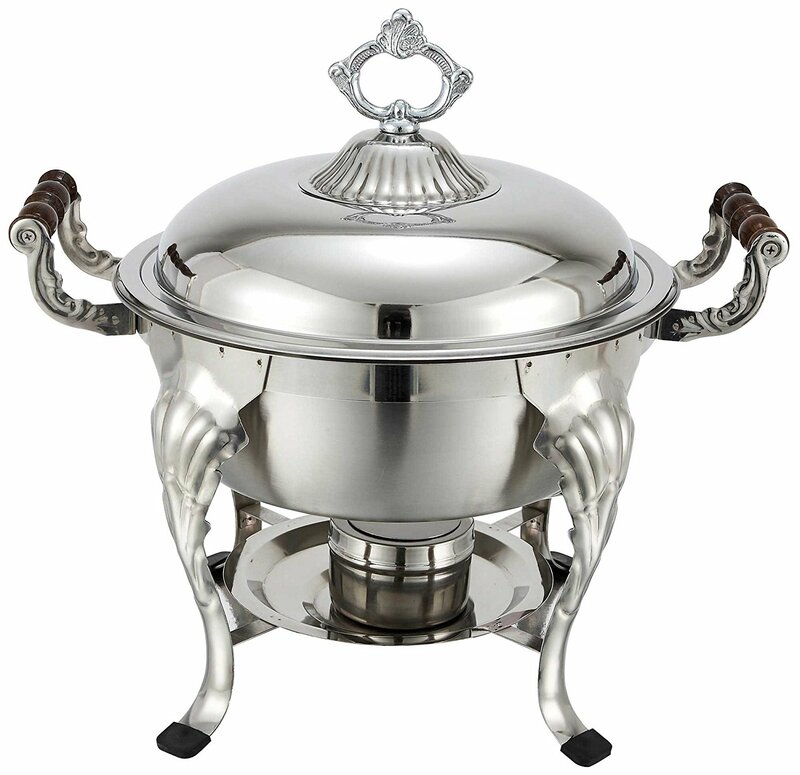 If you’re looking for a round chafing dish that offers a clear view of the food, this Artisan round chafer is perfect. The glass lid lets you see the food without lifting the lid. It also provides a lid holder giving you extra convenience. We all run out of space for the lid! This stainless steel chafer has a 4 quart capacity. It measures 14-inches in diameter and 10 ¼-inches height. 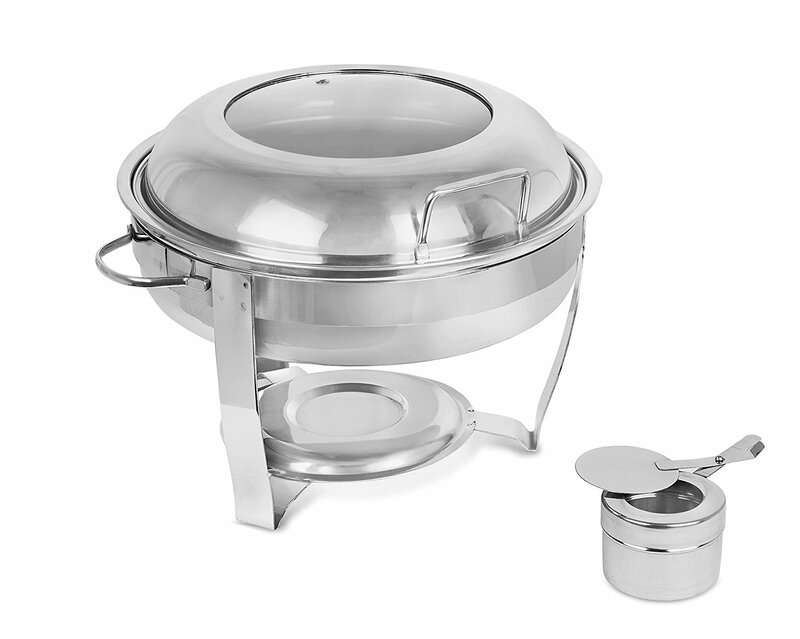 This round chafing dish includes the rack, water pan, food pan, cover and fuel holder. The glass lid includes a steam release vent. This Artisan chafer offers so much convenience with the lid holder. If you’re looking for a chafer that’s just a good for everyday use with the family as it is for entertaining guests, then look no further. The Artisan chafing dish looks good and is also very practical. This Zeny Chafer can be bought as one item or you can save even more money and buy is as a set of 2 chafers or 3, up to 6 of them. 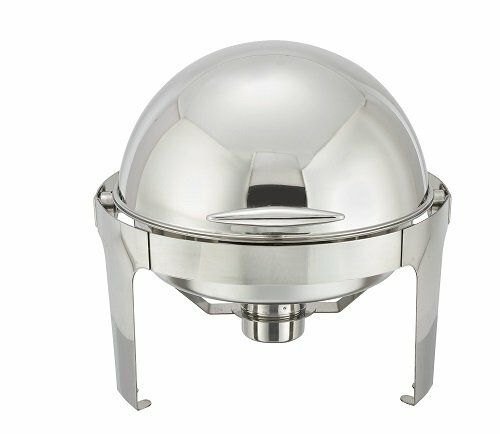 This stainless steel chafer comes with the water pan, a food pan, a stainless steel lid, the frame and an alcohol furnace. The lid lifts off (not hinged). The Zeny Chafer has a 5 quart capacity. The dimensions are 16-inch x 13.2-inch x 11-inch (LxWxH). This round chafing dish is practical and good quality. You can use it for a party or a weekly family gathering. It looks good in the round shape and keeps the food warm as you’d expect. If you need more than one round chafing dish and you’re looking for bang for your buck then this Zeny chafer is ideal. You can order from 1 to 6 dishes and save money. This chafer is great for all occasions. This stainless steel BirdRock Home Chafing Dish offers a lot of convenience. If is one of the few round chafers with a hinged lid. The hinge gives you the convenience of not having to hold the lid while you’re serving or find a place for it on the table. This round chafing dish also has a glass panel in the lid which lets you see the food. The lid is a nice domed shape so you can pile the food higher if necessary. It holds a capacity of 5 quarts. The dimensions are 16.5-inch diameter by 13-inches in height. 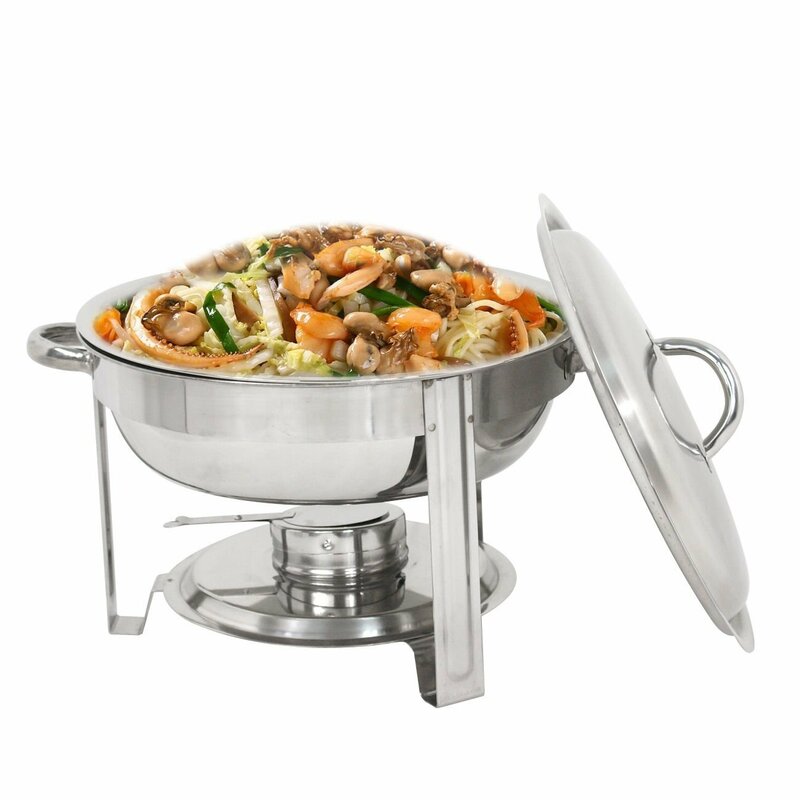 This chafing dish includes the water heating pan, a food pan, the stainless steel and glass lid, the stand and the burner. For convenience you really can’t beat a hinged lid (unless, of course, you want a roll top, see the Winware Roll Top Chafer above). The handle on the front of the lid makes it easy to lift. The round shape of this BirdRock Home Chafer with its domed lid makes it a pretty looking chafer. It would suit any occasion. When you’re looking for your new round chafer, consider what you need and what will look good in your home. It’s easy to see one and think it will be the one but try and make your decision based on how you’ll use it. Do you need a lid holder? Would you prefer a roll top? What about a glass lid? There are so many great features on round chafing dishes, hopefully you’ll be able to find exactly what you’re looking for. Enjoy your new chafing dish. ☑ Looking for the best induction cookware? Read more here. ☑ Do you like convenience in the kitchen? What about an Instant Pot? ☑ Want healthier fries? Time to try an Air Fryer. This entry was posted in Small Appliances on January 14, 2018 by Edwina.